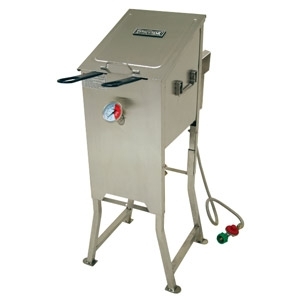 The 4-Gallon Bayou Fryer deep fryer is a revoloutionary way to deep fry, and now is made of all stainless steel. The V-bottom design helps keep the oil temperature lower at the bottom so the batter does not burn and the oil stays clean. This deep fryer is a great fish cooker, and makes quick time of french fries and hush puppies. The Bayou Fryer is also ready to cook. It includes 2-stainless steel baskets with cool touch handles, a temperature guage, drain valve, extension legs, 10 PSI preset regulator, and a stainless braided hose.